We have working with children on mock eleven plus tests. The children were invited to use `multiple choice’ answer papers. In a multiple choice answers the children have to choose answer from a series of choices. In the early days of eleven plus tests, before the advent of multiple choice style tests, children used to write their answer. Answering questions this way came to be called `standard’ papers. It is likely that the questions were the same or very similar – but the difference came in the way the answers were recorded. An optical mark reader reads the answer sheet and adds the marks, right or wrong, into a data base. We used to us a `Lectoread 1282 Optical Mark Reader’. This takes single sheets A4 sheets of paper. The `OMR’ is connected to the computer through a serial port. We used to print our own forms. The scanner knew where the right answer was on the page through a system of co-ordinates. The software was directed to look for marks at set points on the page. The programming was reasonably simple. If the child’s answer was in the right place the question was correct. We used to use our OMR for scanning the results of lesson plans. We stopped using the OMR machine with because we deal with multiple centres and the logistics of entering data about a child’s lesson became more and more time consuming. Our teachers are now able to update, through the internet, each child’s lesson in a remarkably simple manner. It is preferable to fill the answer across the middle of the givens space. We could see which children had been helped with completing answer sheets correctly. Their parents and tutors had obviously spent time on this vital part of the eleven plus examination process. Some children persisted with ticks in the given box. Others allowed the space at the top or the bottom to be filled – leaving the vital central point blank. A blank answer to an OMR machine is a blank answer – it is clearly not right – so it must be wrong or not understood. The National Lottery OMR machines work on the same lines. If your child persists with untidy answers take him or her to the nearest National Lottery outlet. Allow your child to fill in the numbers in a sloppy and careless manner. See if the lottery ticket can be read. Spend a little time, please, with your child discussing `Answer Etiquette’. By the way if anyone can think of a use for our OMR machine please let me know. I do not know why - but I can not bring myself to recycle it. It did come in useful; however, as I wrote this blog and looked fondly at the machine we were so proud of some years ago. Do eleven plus parents really need to follow the laws of parsimony or the laws of economy of hypothesis? We all probably, at times, accept the hypothesis that is the simplest to understand – but explains the most. When we accept a hypothesis we may be trying to reason – but we don’t always know if what we are thinking is the truth. Suppose your child sits a number of eleven plus papers. Your child usually reaches a very good score of around 80% on the tests. You reassure your self that your child is on track and doing well. You hope that your child is going to pass the eleven plus after all the effort and hard work. In statistics the null hypothesis is that there is unlikely to be a difference between children who obtain good marks on practice tests and children who do not obtain good marks – because practice tests are not the real tests. The null hypothesis could, possibly, go on to state that good marks in the practice tests is down to chance – mainly because the tests that your child is working through at home are only a sample of all the available eleven plus practice tests. What lies after the eleven plus? A father of one of our earlier eleven plus children told us of his son’s GCSE results. 7 A* and 5A Levels. These are wonderful results. The boy, however, had lost almost half of his eleven plus year through illness. When he could he worked with incredible determination towards the eleven plus. Our conversation passed onto what lay ahead. He is to take Biology, Chemistry, Mathematics, French and English at A Level. The family had heard that top universities liked a second language. A university qualification is necessary to many jobs. There is the potential of a job after the apprenticeship. Not all occupations offer an apprenticeship. A degree could offer wider choices. It is like putting everything off for a year. Many eighteen year olds are remarkably resilient. 7 A*s and 5As gives a solid foundation for a well reasoned decision. Kuhlmann and Terman tried out and then standardised tests for children aged three and above. They were working on intelligence back in the middle of the 1920s. For example a three year old was asked to name common objects like shoe, watch or knife. A different test asked the child to repeat three digits like 6-4-9 - spoken slowly. A four year old was asked to select the longer of two lines, and discriminate between common geometrical shapes. At five the child was asked to count four objects and define objects like table, fur and hat. The six year had to find missing parts of pictures and note and explain difference between wood and glass. The tests were standardised – and this was probably a good thing because it is likely that there is quite a difference in the confidence of a child aged 3 years and 1 month – and one aged 3 years and 11 months. “Will my child pass the eleven plus? The psychologist advises the parents that a bit of work is needed – but that they are on the right lines. The psychologist does mention the need for a wide vocabulary – as this is useful when working through verbal reasoning questions. The mother asks how many words should her child know aged three? The psychologist counters with the findings of Madorah E. Smith who was also working in the mid 1920 and 1930s. So if your child is average on the three year old test and has a usable vocabulary less than 896 words – then it is probably time to start of pre eleven plus lessons. Is this not too early? Not to a concerned mother! 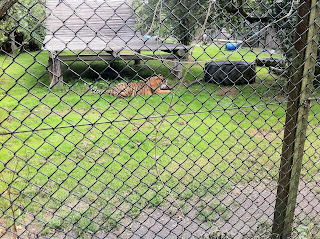 We visited Howlett’s Zoo on Sunday. A few of the zoo keepers were kind enough to chat to us about their life and work. Some zoo keepers are permanent staff and some are temporary. There was a time when no educational qualifications were needed to work in a zoo – but the new crop of zoo keepers are surely likely to be qualified. It does seem likely that zoo keepers have to like animals! It is also likely that a zoo keeper has to be patient enough to be able to answer a whole range of questions from the public. The men and women, of all ages that were kind enough to chat to us, all explained that vacancies are limited. The Zoological Society of London has a training scheme for keepers. Children can enjoy days where they can be zoo keepers for a day. Some bright eleven plus children would love the interaction with the animals and the zoo keepers. We really enjoyed the tyre being dragged around the enclosure as the `wild beast’ fought for its prey. The zoo had a scheme of 10% off retail purchases for passport holders. The net cost was calculated by the terminal. 0.18p was then taken off – representing the 10% off retail purchases. The 10% was taken off the ice cream – and not the toys. Should we have queried the final bill? How much discount should have been offered? Did the odd few pence really matter? We have the privilege of working with some remarkably bright children. Some children seem to find the present crop of eleven plus papers rather boring. After all if you could work your way through an eleven plus paper when you were eight years old the challenge may be rather diminished by the grand old age of ten! On our courses we meet children who are being prepared at home by their parents and other children who are working with tutors. We also have the opportunity of working with children who are trying to gain entrance to super selective schools – and accordingly have eleven plus courses that are demanding. Carpeting 67 cm wide is bought to cover a floor 6.7 m long and 4.9 m wide. What length of carpet will be needed if it is laid (1) lengthwise (2) crosswise? Now children brought up in the families of carpet fitters would probably be able to cope with a question like this reasonably easily. After all, the dinner table may sometimes be regaled with tales of fitting carpets – and coping with exacting customers. We know too that when a room is carpeted from wall to all the carpet is bought in rolls – which are cut into lengths to cover the whole floor. Our eleven plus star took the question in her stride. First of all, for about ten seconds, she tried to do the question in her head – before setting the answer out neatly and logically. The width of the room is 4.9 m = 490cm. The number of strips = 490 divided by 67 – which is 7.3 strips. 8 strips, each 6.7 m long will be needed = 53.6 m.
Therefore 54 m must be bought. Therefore 49 m must be bought. We did not, however, attempt to test her with the dilemma faced by many families who do not want to enjoy the cheaper option of a carpet going sideways. Some parents, trying to maintain a good relationship with their eleven plus children, may feel that they need a little more than a positive connection. They may want their child to feel that individual needs are being heard and listened to. Some parents may even feel that they want their child to be offered a large measure of self control while carrying out eleven plus work. A key reason for parents to adopt this approach will be an attempt to bolster their child’s self esteem. Some eleven plus parents, however, may feel that they need to try to maintain a distance between being a warm loving parent and an effective eleven plus teacher. We can recall how we used to call our teachers `Sir’ or `Miss’. Perhaps children will need to call their parents, at times, `Eleven Plus Sir’ or `Eleven Plus Miss’. This may help to maintain the necessary convention. The emotional tone and atmosphere of an eleven plus lesson needs careful thought and due consideration for the feelings of all parties. What an exemplum! The trusted and jealously guarded `successful’ eleven plus super teachers do not possess dark arts – over the years they have proved again and again that they have the ability to help children pass challenging eleven plus examinations. Eleven Plus teachers working on a one to one, or even an individualised basis, use proven techniques of communicating with their pupils. If we could be a fly on the wall during the lesson we could apply a technique called `Interaction Analysis’. This is a continuous record of the activities of the teacher and the pupils. In one sense the development of an eleven plus lesson needs to follow a series of events which occur one after the other. If the lesson lasts an hour then the teacher sets into motion a chain of events. The eleven plus child, being a child, has the ability to alter the lesson. Eleven plus parents can have input into the lesson – by asking for help with particular problems, seeking advice and offering observations on the progress of their children. In an ideal situation the `Interaction Analysis’ observer would record the progress of the lesson every few seconds. What some eleven plus parents may want to find out is the ratio of direct teaching to indirect teaching. In direct teaching the teacher talks, lectures and gives directions. Indirect teaching involves the teacher in asking questions, praising and communicating on an informal basis. Some parents want their children to be lectured. These are the parents who want their child to be told what to do and how to do it. Other parents would want their children to enjoy the freedom to work out answers for themselves – and develop their own strategies for solving problems. There is no question that anyone can argue that direct teaching is better than indirect learning. In just the same way few would be able to argue about the effectiveness of one `super’ teacher as opposed to another `super’ teacher. Naturally there will some parents who will want to lecture their children for the duration of the eleven plus. Other parents will try hard to try to be a little more reactive. Most parents will walk a broad line some where between these two extremes. Do you remember this section from a passage from `Emma’ by Jane Austen? The charming Augusta Hawkins, in addition to all the usual advantages of perfect beauty and merit, was in possession of an independent fortune, of so many thousands as would always be called ten; a point of some dignity, as well as some convenience: the story told well; he had not thrown himself away--he had gained a woman of 10,000 l. or thereabouts; and he had gained her with such delightful rapidity--the first hour of introduction had been so very soon followed by distinguishing notice; the history which he had to give Mrs. Cole of the rise and progress of the affair was so glorious--the steps so quick, from the accidental rencontre, to the dinner at Mr. Green's, and the party at Mrs. Brown's--smiles and blushes rising in importance-with consciousness and agitation richly scattered--the lady had been so easily impressed--so sweetly disposed--had in short, to use a most intelligible phrase, been so very ready to have him, that vanity and prudence were equally contented. It may be interesting to note that £10 000 in the 1800s is probably worth (according to some website) to be worth around £384 622 today. This amount could possibly quicken the pulse of some young men as they contemplate following their loved one through clearing to the same university! Would it be possible to think that some parents could contemplate placing the care of their child in the hands of a tutor within the first hour of introduction? Could parents meet the tutor, discuss their child, understand what the tutor offered and make a decision in such a short time? Of course! And why not? Most parents will work on recommendations. After all, Mr. Elton would not have got near to Augusta Hawkins if he had not been introduced. Congratulations to all the `A’ Level students on their A Level results. We wish them every success in the future and hope that they are happy and successful in their future careers. The sort of question that we would expect an A Level pupil to answer during the duration of the A Level Statistics course suggest that A Level results, in some fields, are not being dumbed down. Hypothesis 1: There is no difference in the 11 Plus results in Kent and the rest of the country. Hypothesis 2: The 11+ results follow a normal distribution. Hypothesis 3: There is no correlation between the length of time spent in Kent on 11+ preparation and that spent in the rest of the country. Anecdotal data from parents and tutors. Eleven plus results region by region. Hypothesis 1: Is there a difference between 11+ results in Kent and the rest of the country? Are there other areas like a possible difference in eleven plus examinations that need to be looked at? Hypothesis 2: Why should eleven plus results follow a normal distribution? Hypothesis 3: Was there a significant difference in the time spent by candidates from Kent compared to the rest of the country? A Level students would be expected to be able to devise methods of collecting and analysing the data. A Level students would be expected to be able to draw conclusions about the data. Depending on the findings, should parents move into Kent or out of Kent if they want their child to do well in Eleven Plus examinations? Your eleven plus child will be answering questions like this in just a few years time! If you ever thought that your child was a `brave little soldier’ to work through all those eleven plus papers, think of how some parents from other countries treat their children. In 1835 Gardiner visited the Zulu. He found them using an ingenious method for setting broken arms. The arm, with the hand open and the fingers spread, was placed in a hole. The hole was then partially filled with clay. Members of the family, and friends, then lifted the `patient’ out of the hole. The arm was then wrapped in a secure splint of back. What price the labour and pain of an eleven plus paper? Some African cultures, used to believe in the talents of `healers’. There were two kinds – the healers who used herbal medicine to set a broken arm, for example. The same healer could also call on the benefit of Priest-diviners who would be able to explain how some one in the family had been upset – hence the broken arm. Eleven Plus families should not, perhaps, call upon the spirits to help – unless they are pretty sure that credit is offered where it is due. If the mother of the family, for example, has done particularly well on an eleven plus question – then she should be offered full recognition for her actions. The Priest-diviners occupy a jealously guarded position in traditional society. Their role is to smell out witches and provide treatment for diseases. I am not sure how a Priest-diviner would solve the problem of long division. Would the Priest-diviner use herbs or prayer – or a combination of both? There is, however, a possible eleven plus solution. We know that many, but not all, Priest-diviners use dancing to try to help to reach the state where their utterings are taken for granted. We know too that whistling is often used by spirits to communicate with the living. A collection of eleven plus papers. The benefit of a mother’s ability to do long division. A bucket of clay – just in case it will be needed. A member of the family who knows about herbs. A member of the family who can pray. And finally a dancer and a whistler! Can you picture scene? Mother and Father dancing round the kitchen table. Dad is reciting his tables. Mum is still explaining the division to any one who wants to listen. Older daughter who is still a little bored. Eleven plus candidate whistling and wishing that he or she was elsewhere! And finally the cat, who persists in climbing in and out of the `just in case’ clay pot. But what happens in the family if you want to teach your child a lesson about working when he or she does not feel like work? You may, for example, want your child to do some `real’ work. Sadly the Children and Young Person’s Act of 1933 prohibits anyone under the age of sixteen from engaging or being employed in street trading. You can not, for example, send your child out to sing on the street corner – or offer anything for sale. I am not sure, however, about the wording in the 1989 version of the Act – and how much it relates to children accompanying their parents to Boot fairs – or organizing garage sales of used eleven plus papers. There is, however, special provision for children taking part in entertainment. The 1963 Children and Young Person Act prevents children under the age of 16 taking part in activities where a charge is being rendered – unless the Local Authority has given permission. The license can only be granted if the local authority feels reassured about the child’s welfare and educational provision. Very few eleven plus parents would want their child to feel that he or she was being treated harshly or unfairly over the holidays. Even fewer eleven plus parents would want to have a protracted argument with their child over working through eleven plus papers. (“Leave it off, love!”) Sitting in the car and watching their eleven plus child beg for alms must also be rather low down on the list of desirable activities. Thus bad begins and worse remains behind." Parents can only exhort their children to work hard and do their best. Parents can only say that one day it will be worth all the hard work. In an ideal world children can only look lovingly at their wise and wonderful parents, accept the inevitable, cease arguments, and get on with the work. Elitism in education was believed, by some, to mean that the educational resources and the efforts of the wider community should be used to educate a small proportion of children. The `Elite’ children would need to possess the greatest ability and potential. Thankfully the Eleven Plus examination is not aimed at selecting the brightest of the bright – it tries, in most parts, to select children who are in the top twenty five percent of the population. Children in an `Elite’ band at school would have had the benefit of a markedly different education because they would not have been held back. We can possibly presume that elite children would have been taught by better qualified teachers – and in smaller classes. After the Second World War it was felt that while the education of the Elite was important – the country may be better served by establishing grammar schools to work with a wider range of the more able. The theory was that the Elite would take their place in an educational system shared by all – except those in the grammar schools. Today, many `Elite’ children are served very well by the comprehensives and new Academies. Some very bright children never go to grammar schools. Very able children have to understand their role in society – and learn to appreciate the responsibility placed on them by society. Removing these Elite children from the main stream and segregating them into `special’ schools may be counter productive. The Eleven Plus allows parents the opportunity to prepare their children to work in a favourable environment with other children who have scored highly on ability tests. Children who are gifted in music or ballet are offered the opportunity of entering special schools. Selection at eleven was originally offered to parents through a wealth of grammar schools. Today there are far fewer grammar schools. The advocates of comprehensive secondary education claimed that comprehensive schools would offer opportunities to a wider group of children with a wider variety of gifts and talents. The new Academies also designed to provide favourable conditions for enrichment and extension activities. Some children of high ability can be accelerated – or passed to higher classes. Experience, in a number of cases, seems to suggest that the developmental age of some children does not always keep up with their intellectual age. The have been, for example, instances of social problems. Some primary schools, therefore, allow able children to be taught specialist subjects in higher sets. The Eleven Plus ought to offer the ability to enrich the curriculum of the more able children. There some difficulties, however, because not all schools with grammar areas actively promote the Eleven Plus. The playing field in the examination is not, therefore, a level platform. There is also the danger that children preparing for the eleven plus can be taught skills that anticipate Year 6 work – and even that of the secondary school. I have mentioned before one of our current ten year old pupils who has worked with us on an accelerated and advanced eleven plus course – and has just managed to be two marks off a `B’ grade on an Edexcel Higher Mathematics paper. He spent around ten minutes on the simultaneous equation question before admitting defeat. His attempt, however, did involve trying to devise a graphical solution. The algebra itself was beyond him. He did not realise that he could find `x’ by taking one equation from the other. My 1952 edition of DIAGNOSTIC AND ATTAINMENT TESTTING (Including a manual of tests, their nature, use recording and interpretation) by Fred J. Schonell and F. Eleanor Schonell (Oliver and Boyd) is just two years older than the first edition of 1952. The Schonells were particularly concerned with selecting tests that were suitable to the intellectual calibre of testees. In their time the Schonells were highly influential in educational circles – and we can only wonder if the authors of the early eleven plus tests drew on the experience and findings of the Schonells. A convoy of 25 tanks, each 18feet long is parked alongside a straight road. There is a twenty foot space between each tank. What is the distance between the front of the first tank and the end of the last tank? If the days are hot, and your child needs a reward – then you could offer an ice cream. To prevent the cone dripping, cut a hole in the centre of a paper plate and insert the cone. Try to make sure your child continues to contemplate the effect of the length of the radius on the spread of the ice cream! If your child continues to `mumble’ about the heat, the air conditioning, the length of the journey, fatigue, hunger, thirst or any other sort of grumble – then help is at hand. Dig out the hot water bottle last used in the last energy crisis. Fill the bottle with crushed ice and put it on the back seat. Finally – and I am not sure that you will get away with this one – but if you reward your eleven plus daughter with a trip to the beach, and you find that her costume is a little too small, then cut the costume into a bikini, then hem the raw edges. You and your daughter may even choose to add a little trim. I would interested in your daughter’s comments. I digress – what are you going to do with all those used and unused eleven plus papers when the examination is over? Naturally you could recycle some or even keep some for the next sibling or relative. Suggestions on a post card please. Thank you. When your child has a problem – and needs help to solve the problem – you are offered insight into how your child’s mind works. One would think that an eleven plus child has nothing much to hide from a devoted mother and father – but some eleven plus problems can help to bring out the best in all factors of the family. Diagnostic tests try to work out where a child is up to and what work needs to be done. A level test, however, give us levels of attainment. The final eleven plus test is neither a diagnostic test nor a level test. It could be called a `Pass Fail’ test. The final test results are not posted back to the school or to parents. Under some circumstances parents can see the actual test and their child’s responses – but this is not an option that is open to all. The actual eleven plus tests do not progress on a step by step basis. There are, however, a range of problems that have to be solved. Ideally the problems would be above the level of rote learning. We are in the middle of eleven plus courses and can see how some children actively explore and think about problems. Some children seem to be able to apply common sense in an attempt to arrive at a solution. Some children seem to have the benefit of strong specific knowledge and are able to display sound mathematical knowledge. The multiple choice element of the eleven plus examinations offers ease of administration and collection of results. Yet oral and practical eleven plus tests may add richer information – and this could allow different children entry to grammar schools. Of course there would be a cost to have an `expert’ present a few problems and then make judgements about the ability to explain strategies. There was a Swiss Psychologist called Jean Piaget. He had a considerable number of theories on education, school and children. He was born in 1896 and before he reached the age of fifteen he was researching into problems in zoology. He was offered various position of some importance in the academic world after correspondence with eminent and learned zoologists who were unaware he was a school boy! Every eleven plus parents will understand the relevance of the next few sentences. He was a married man with three children – and he maintained that it was his children who taught him much about intelligence! Sadly his children were educated long before the eleven plus was even thought of – otherwise we may have had a different perception of the nature and the intent of the present examination. He developed what is called the `constructivist theory’ – which viewed learning as an active process in which people continually construct new knowledge from their experiences in the world. According to this theory people do not get ideas – they make them. Think of an eleven plus world where children did not have to slog through eleven plus papers – but were encouraged to think about and develop new ideas for assessing children at the eleven plus stage! Instead of teachers and educators sitting in front of their computers building endless tests and eleven plus papers designed to test and develop different types of eleven plus ability – these same teachers and educators could be helping, mentoring and guiding children to think for themselves! Of course Piaget was criticised by British writers who felt that his work lacked sophisticated statistics. But think – the eleven plus is based on the supposition that a cumulative score on a numbers of papers can give an accurate measure of a child’s ability. The eleven plus examination gives us a score that children have to reach in order to earn a place in a grammar school. In the face of a lack of recent published research – surely this is taking for granted that all children fit into one mould? Eleven plus children have to `get the right answer’. We can see this from the examination and the different types of practice papers. There is little place for the eleven plus to be able to look at the methods children use to arrive at the answer. If the eleven plus was altered to try to encourage children to demonstrate that they understood the method of arriving at the answer – as well as the actual answer we would be sure that this would lead to a different type of examination. What form should the examination take? This is where we need to ask the children for their opinions and ideas. We may need to catch them early on before they became too indoctrinated. Our eleven plus children would need to be educated to be able to understand where they were going and what type of child the grammar schools wanted. Spending time on this exercise may be more useful that working through question after question. Do you remember the Rime of the Ancient Mariner? Can you recall those two memorable verses? I am stuck before eleven plus papers. Oh dear. Oh dear! Woe is me! What books and which selection papers do we need? Do we use cast off papers or buy fresh clean copies? How do we cope with poor child if he or she does not feel in the mood? What do we do if our child has copied some answers? Do we go back over questions to revise and re-teach – or do we keep pressing on? Do we back off sometimes and have a break or do we keep going throughout all the seasons? Do we even think about extra help or do we remain confident in our own ability? What do we do if a question is just too hard? Do we spend more time on weak subjects and topics or do we try to maintain a regular routine? How do we cope with our child if there is some evidence that he or she is becoming stressed? Do we plan for a break during the holidays before the examination? How do we make time to spend time with our candidate? What do we do if the phone rings in the middle of an intimate eleven plus session? Do we sit beside our child during our work together or can we wander off and wait to be called back? Should we rely on the on-line test results? Do we discuss our child’s progress with family and friends or do we smile and maintain that the family is doing the best it can? How much say should we offer our child in determining what work should be done? Is there any point in doing `just ten minutes a day’ or would more depth help? Is the school going to help? Should we just move out of the grammar school area? Suppose your child does seem to have a little difficulty, at time, with reading questions. You know in your heart that your child read early, writes reasonably neatly, has no real history of mirror writing and does not appear to have any apparent speech and language problems. You also know that sometimes children have problems with visual perception. Of course you have had your child’s eyes tested – but you are still sure something is wrong. You are now decisive and want to make decisions – and make things happen. What can you do? A test of visual perception has many forms. In an elementary mode your child will be presented with a series of geometrical drawings consisting of a circle, a cross, a rectangle and a diamond in a vertical position. Present the drawings on a neutral background. Then cover the drawings. Show the circle – but do not say that the shape is a circle – and ask your child to `make this’. Your child is then shown the cross, rectangle and diamond – and asked to draw them in turn. As the drawings are being made, look to see where your child starts the drawing, is the direction from left to right or right to left? Does your child draw a continuous line or are there reversals and changes of direction? Are the drawings of a consistent size? Are the drawing presented neatly – or is the work scattered over the page? This may seem to be a remarkably simple test for your bright eleven plus child to work through. What you are doing, however, is collecting evidence for yourself. After all if you thought that your child had measles you would gather any symptoms before asking the doctor to look at your child. You would be aware of the sensitivity to light, the runny nose, the temperature and the general irritability. If you felt that your child was not seeing the correct shape and pattern of words – and was also having difficulty with shapes you could, but may not, discuss these symptoms with `Your Doctor’. Your medical doctor may be interested in what you have to say – but hopefully will not offer you any medication! It can very difficult for a doctor to be able to justify a consultation with a specialist. One to one teaching can not guarantee that your child will look at words and pictures more accurately – and will pay more attention – but could help your child to understand how and why he or she is making the mistakes. In the same way patience with your own child around the kitchen table could help to build awareness and reduce the number of mistakes. Misreading or interpreting some words and pictures in an eleven plus exercise does not automatically mean that there is a problem. It could be interesting, to some, to look at the factors affecting relationships between eleven plus children and their parents. Family patterns probably stay around the same for the duration of childhood. A mother who fussed over her child in the pram – worrying about outside influences, concerned about television watching and adamant about the virtues of reading is probably going to behave in a similar way when the child is ten. Children up to ten are likely to name their parents as ideal role models. Some eleven plus children, however, may mature a little faster than their contemporaries – and so lose their rosy tinted image of mum and dad at a younger age. Some children, after the age of ten, may start to identify themselves with more glamorous role models. Some current eleven plus parents may, sadly, feel a sense of loss when they realise that their child has found new allegiances and role models. It must be pretty naturally for some eleven plus children, at one time or another, to develop a compulsion. Compulsive behaviour can be both a blessing and a curse. Naturally most parents would want to channel compulsive behaviour into work and study habits. We can not, however, have everything we wish for! Some eleven plus parents may be delighted that their child has became obsessed with canoeing – but others would, possibly, be much happier with a stated desire to devour as many eleven plus papers as possible. We would all like to think that an eleven plus child from a positive environment – with accepting and non dominant parents – would enjoy better relationships with peers, parents and other adults than children from negative environments. One again we have a number of children on eleven plus holiday courses at Hurst Road Community Centre. There are some wonderful trees to climb. Naturally some children are attracted to the trees – and become attached to them. There are no notices or edicts about climbing trees at break time. I simply suggest that the child seeks permission from the parents - and with that permission the trees are available. Some parents seem to think that a child’s score on a verbal or non verbal reasoning test is a direct measure of intelligence. Intelligence tests, however, are not quite the same as reasoning tests. If your child one day feels uneasy because of an odd score on a test then this does not mean that your child’s ability has suddenly gone into a decline. Any number of factors could affect a rogue result. What kind of rewards can you offer to your eleven plus child? What kind should you offer? Should you offer any rewards at all? Think of Horatius when he stood on the bridge and kept the hoards out of Rome. Do you remember? Two friends and fellow warriors rose to his challenge – and stood on either side of him as the rest of his army hacked at the bridge to bring it down. The opposing army rushed at the three – who held out until the bridge fell. Horatius was the last to leave the bridge – defying thirty thousand attackers. He swam to the side of the river amid great shouts and clapping. He was given corn land – as much as two oxen could plough in a day. The grateful city made a molten image – and set it up on high. If your eleven plus child passes give him or her a piece of land where he or she can build in years to come. A different reward could be to engage a sculptor and commission a full size figure of your child in his or her moment of triumph. What reward, however, could have been offered to Jeremy Bentham? He was one of a number of infant prodigies who seem to have been common in the eighteenth and nineteenth centuries. Before he was four he was reading history. At four he learnt Latin Grammar. He entered Queen’s College, Oxford, at twelve, graduated at fifteen and received his M.A. at eighteen. He went onto suggest to his readers to contemplate `Psychological Hedonism’. He believed that man is so constituted that all his actions are determined by the desire to seek pleasure and avoid pain. In simple eleven plus terms, and putting it rather crudely, your eleven plus child can only feel reformed and work diligently when he or revels in eleven plus work out of the sheer enjoyment of studying – rather than for any punishment (or reward) by the parents! But Bentham did not have to pass the eleven plus to get into Oxford! Some songs or lyrics just seem to improve with time. There can be few of us who can resist singing the words or humming of tune of `Robin Hood’. I am very fortunate to have a copy of the 1927 `Robin Hood’ play by Alfred Noyes – who also wrote the poem, ‘The Highwayman’. This one act play was not particularly written for children – and was not really an adaptation from a novel. One act plays are often used to introduce a young audience to the classics. Plays can be used a reader – but because they are plays they should be acted rather than read. As it is a play we are sometimes encouraged to learn the words by heart. The imagination of all of us can be excited by understanding the important stage entrances and exits – and the movements on the stage. Naturally props play a large part in plays – but there must be an extraordinary difference between the propos used in the 1927 version and the latest BBC television epic. What does a play give us? It gives us team work and training in speech and drama. Robin: You did not drink the health, sir Knight. I hope you hold with Lion Heart. When is your bridal day with Robin Hood? Marion: We shall be wedded when the King comes home. Outlaws: The King! The King! Robin: The King comes home from the Crusade! Here we can see a basic weakness of the eleven plus. Almost any eleven plus teacher or eleven plus parent can write their own eleven plus questions. Chose one word from List A and one From List B. Taking into account the return of the King from the Crusade, which two words or phrases are most alike? Your fault: because you did not study your Thesaurus with your child? Your fault: because you did not read a wide enough range of one act plays with your child? Your fault: because you did not read `The Highwayman’ with your child? Your fault: because you allowed your child to watch too much T.V.? Your fault: because you did not take your child to an eleven plus teacher who would have taught your child about the Crusades? Your fault: because you bought the wrong eleven plus papers? Parents really do have the capacity to feel guilty about all sorts of things to do with their children – or is it not `your fault’ at all?